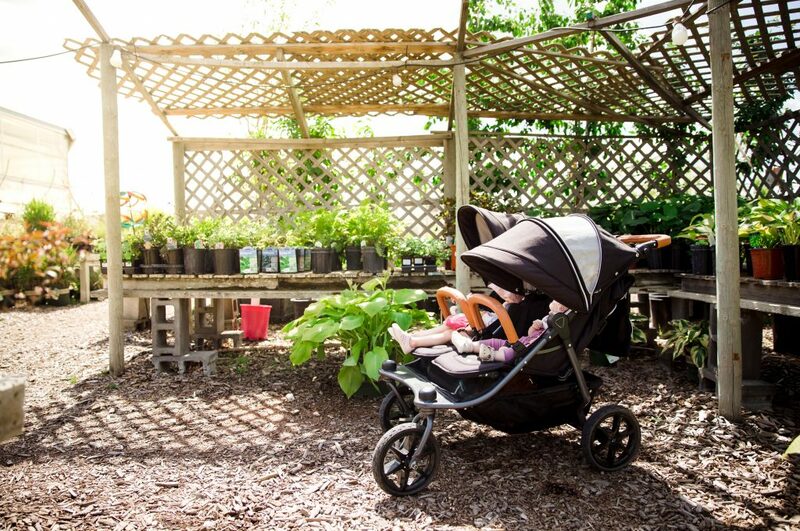 The hunt for the perfect double stroller. 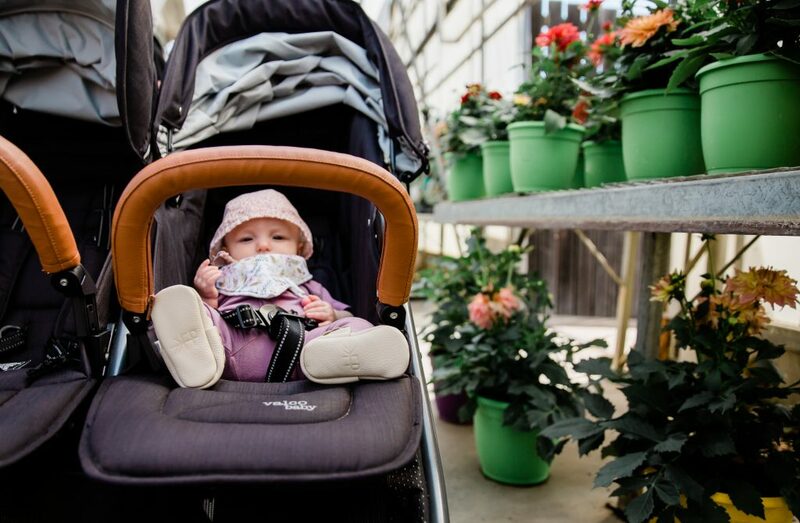 We started this journey when we had Autumn and I settled on an inline, only to discover later when Autumn was a bit bigger, that it drove like an F150 when there were two children in it. 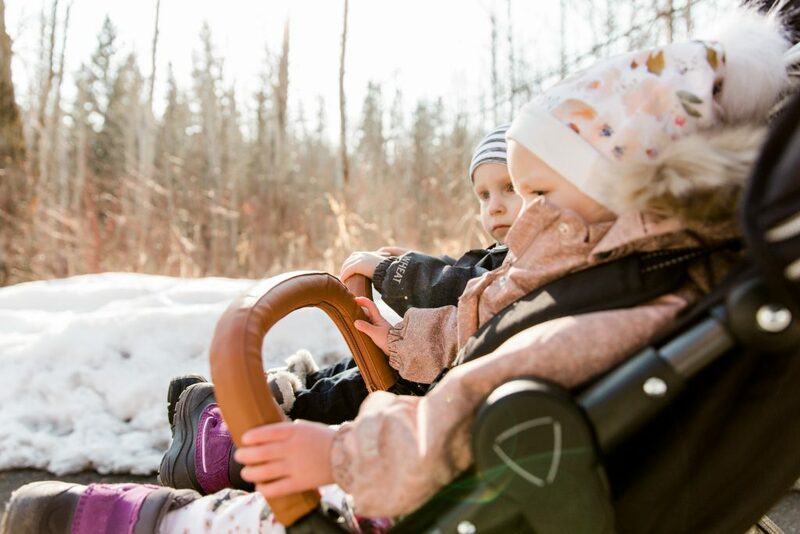 I also noticed my kids really liked being side by side so they can interact and share snacks, like they do in our chariot. So when Georgia was born, I was faced with this decision again, do I stay with my current situation and groan and complain about how annoying this inline is or do I start the hunt again for a better side by side option. Well I decided to look again. I learned a few things after testing out literally every side by side on the market. There are basically two types of side by side options, posh and stylish (but not so rugged), or super utilitarian but lacking any style and polish. That was until I came across the Valco Baby. These aren’t available in any of the stores in Edmonton I visited which is why I didn’t think of them earlier. It was when a friend of mine who had a Valco mentioned I should look them up online. They looked amazing. After reviewing all the specs I decided this was the one! It was shipped to me in big box and me and my three favourites assembled it with no issues. I chose black night with the caramel leather bar covers. GORG! I loved how it was made with solid metal and air-filled tires. Definitely checked the functional box. 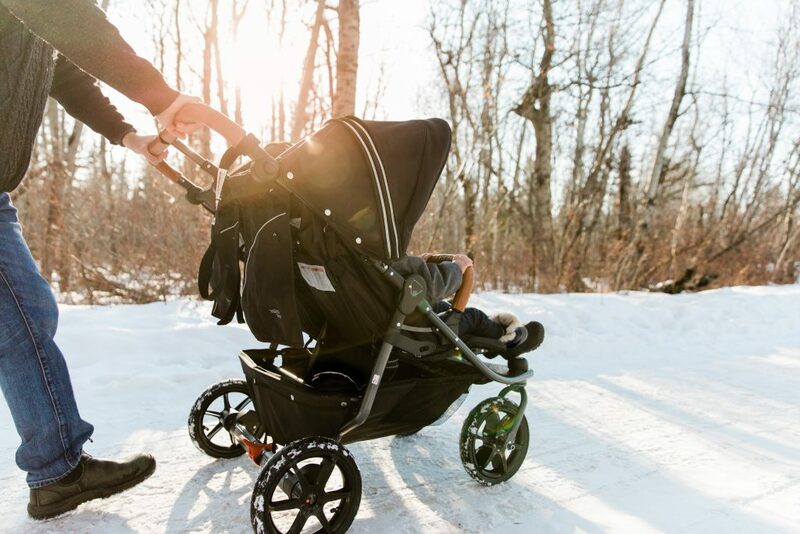 We like to go for walks on varying terrain so having a stroller with good suspension and a solid frame is a must! 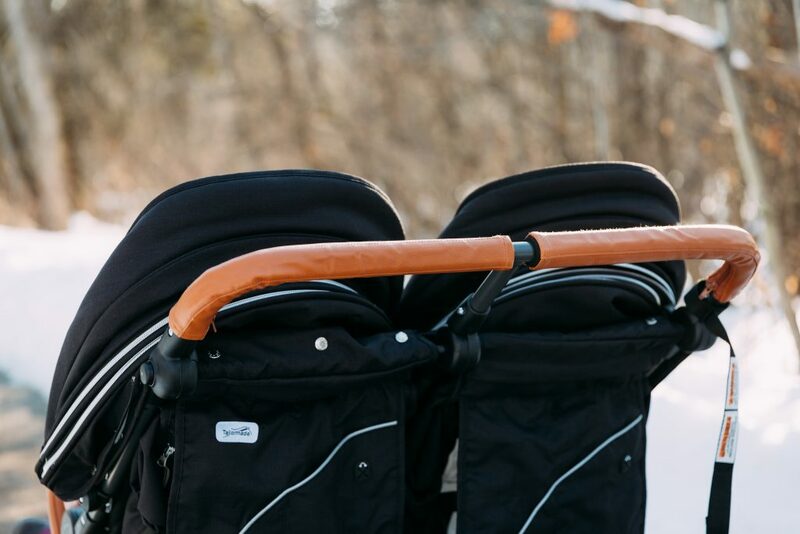 Another super functional feature on my Duo X, that I adore (and couldn’t find on any other stroller) was the large zip out canopies. You choose the level of coverage you want and zip down for more and up for less. Amazing sun coverage for my fair littles, especially my redhead :). I also LOVE that I didn’t need any extra parts or attachments for when Georgia was an infant. 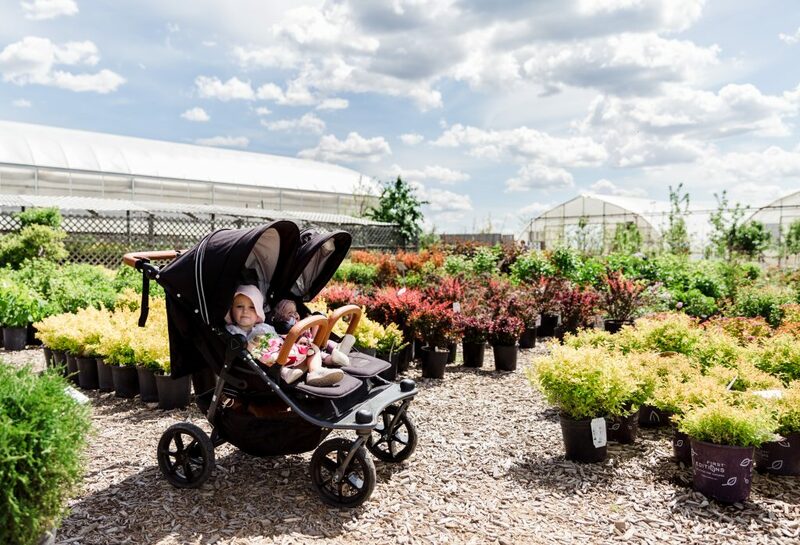 The seats pull down to a full recline, creating a little bassinet type spot for infants right from birth (no expensive bassinet add-on that you only use for a few months). Now she’s almost 6 months so I just pull it up to the angle that works best for her, and she’s as happy as a clam. And as mentioned earlier I can pull the canopy down to completely cover her creating the perfect little nap pod for long walks. The front wheels also lock, allowing for light jogging as well! So check and check with functionality and utility. But what about style? Yup checked that box as well. I love the sleek fabric and dark grey finishes. Add the gorgeous leather handrails and this beauty can compete with the best of them in a looks contest. 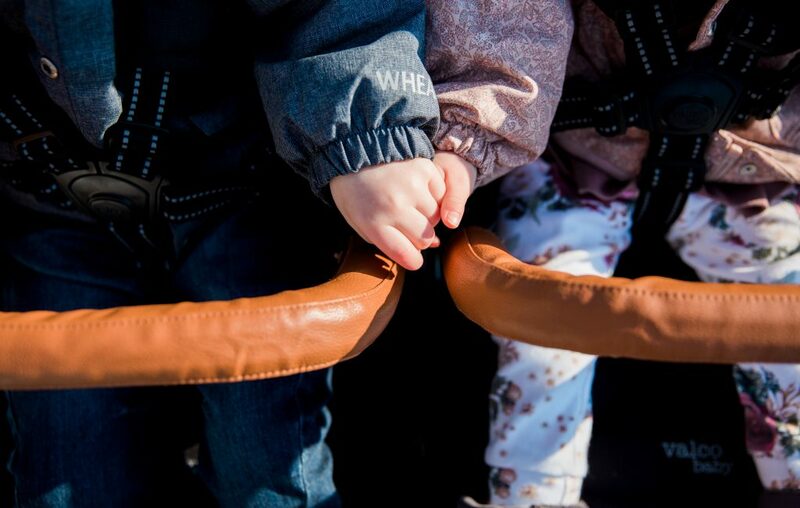 My kids are happy because they can easily climb in themselves and love riding beside each other! If you’re in the market for an awesome double, this one definitely gets my vote! 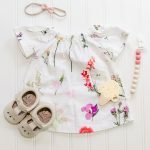 My Summer Style Must Haves For Georgia’s First Summer!